Congratulations! You bought a new home. It does not matter if it is your first or third home, what is important is for you to know the systems that regulate the comfort levels in your house before they require some major repair. With this, you will be able to do preventive maintenance on your HVAC system, detect signs of problems, and avoid newbie errors. In return, your HVAC unit will provide you with optimum performance and excellent energy savings. Age – although a few HVAC systems appear to last for decades, many of them begin to see problems after 10 years. Efficiency rating – heating and cooling systems have EER, SEER, and AFUE ratings. The unit is more efficient if the rating is higher. Warranty – apart from learning the term of the warranty, you have to know what actions could possibly void it. Maintenance Inspection Results – In case the last homeowner was able to maintain the HVAC system, they most likely have hired an HVAC contractor to maintain the unit on a yearly basis. Don’t forget to ask for the inspection reports to find out about the kinds of problems the unit might have experienced in the past so you would know what issues you might face down the road. 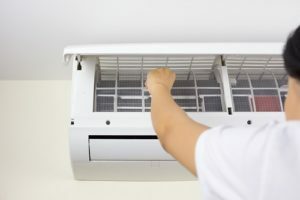 Among the most effective yet simplest ways to make sure your HVAC unit remains in good shape is to replace the air filters as often as required. The frequency commonly range between one and sixth months. Some systems come with thermostats that remind users when it is time to change the filter. A well maintained landscape does more than just make the exterior of your home beautiful. It can help improve the performance of your HVAC Florence. However you have to make sure that plants, trees, shrubs, as well as other foliage must be at least three feet away from the outdoor unit. Garden tools, furniture, toys, and other garden supplies should be kept away from the outdoor unit as well. If you are trying to cut costs on heating and cooling expenses, it is not recommended to close the vents. Although it will help you save money, closing the vents will force your system to work harder than it should to make sure that your home comfort levels is where you want to be. Because of this, an experienced HVAC contractor will never recommend blocking the vent registers with any object. In case you only just want to cool or heat specific areas of your house, you have to talk to an experienced HVAC expert like Florence HVAC Experts about making different zones. Call Florence HVAC Experts if you have any concerns about your HVAC system whether you are first time homeowner or not.